Home > Read the papers! > Romania’s biggest football club? Of course, it’s St…op! Romania’s biggest football club? Of course, it’s St…op! Back to the one behind the headline: on Sunday evening, Romanian multiple (running and most likley future) champions had to take drastic measures, following a lost lawsuit. The name, the biggest name in Romanian club football, the European Cup winners from 1986, Hagi’s former and beloved team, cannot be used anymore for now without the approval of the former owner of Steaua Bucharest. 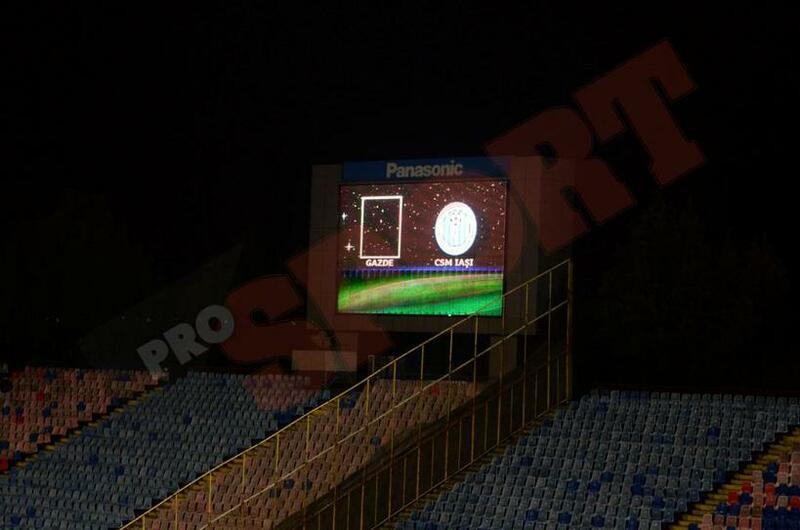 The name was erased from the scoreboard of the stadium that hosted the 1-0 victory against CSMS Iasi. A square represented the current league leaders who are on another solitary run towards the title, while the name and the logo were erased from the players’ shirts, the dugout and any other visible place it stood before a Romanian court reached a shocking, but fair decision. On the scoreboard “Hosts” was written instead of Steaua. For a photo gallery go to http://www.prosport.ro. UPDATE: After a meeting that took place on Monday afternoon, Becali’s club has been granted the right to use the name and the logo for the last two official matches of 2014. Negotiations are expected to take place at the start of next year, with the Ministry of Defense hoping to make Gigi Becali pay an important sum to continue to use the brand.